Low viscosity base mineral oil formulated specifically for bicycle hydraulic brake systems. Assures maximum life of brakes with excellent performance in a wide temperature range. • Prevents foaming and overheating of the pump. • Will not corrode gaskets and plastic parts. cod. 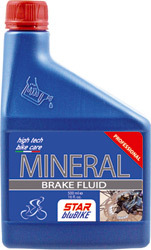 20031 MINERAL BRAKE FLUID 100 ml. cod. 20032 MINERAL BRAKE FLUID 500 ml.